Memory foam fit so boot 'moulds' itself to your foot/ankle shape! Our testing for the Meindl Burma Pro MFS Walking Boots was over several long day walks in the Lake District and the Cairngorms. The relatively high ankle cut plus generous padding around ankle cuff and throughout length of tongue meant that these boots were immediately comfortable. And they remained so on subsequent day's walking. Both toes and heels are well protected and there is excellent support both laterally and longitudinally. From the Vibram sole, there was also excellent grip on grass, mud and rock. 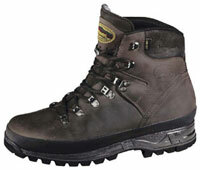 The lacing system is very good - the eyelets are placed well - so the boots are easy to get on and off. My feet were kept warm and dry throughout the test. There is also a good rubber rand to protect the boot upper from scuffs and scrapes. Despite the level of functionality, they are relatively light-weight. The only negative comment I have about them is that the goretex lining may make the boots hot in summer. However, I think the performance overall outweighs this. Excellent performance albeit at a reasonably hefty price. Worth it though if your walking is mostly in the high mountains. However, I have also used the Meindl Burma Pro MFS Walking Boots for lower level walks and found them to be equally at home in this terrain. They are not officially 'badged' as crampon compatible. However, I have used them with flexible crampons for short periods of time.